Grohe’s architecturally-inspired Atrio range of taps for the bathroom has now been expanded to encompass the kitchen. The range has been designed to be visually striking, with aesthetic appeal ranked as highly as functionality, allowing the creation of a beautiful centre piece using one of the most highly used items in their kitchen. The Atrio kitchen range will feature the classic two-cross handle design, a popular design feature in many British kitchens. 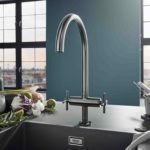 The collection of taps will be available in three finishes; Chrome, Supersteel and Brushed Hard Graphite, and have been subject to rigorous testing to ensure they offer a PerfectMatch with GROHE’s range of premium stainless steel sinks. The range also benefits from ergonomic features such as a swivel spout with a range of 180 degrees whilst the arched high C-spout enables the easy filling and cleaning of large pots and pans.